Artopex’s laminate Take Off Tables are the economical solution for a meeting area, a conference room or as cafeteria tables. The tables from the Artopex Take Off collection are known for their durability and wide range of formats, sizes and finishes. The person you choose to help you is very important. Lynne Lemieux has the experience to help you make the right selection. Here we have a very popular Artopex Takeoff boardroom setting including the boardroom table with visual board and credenza storage unit along with Artopex half moon bookcase units. I have used this set up in training centers, meeting rooms, study areas and in any business setting where collaborating with team mates or discussions with clients or partners requires a setting of professionalism. 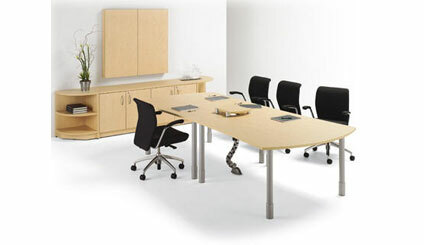 The Artopex “Takeoff” boardroom furniture is a very affordable custom furniture solution where quality and price meet.